The DIY paint nest box kit from Ruddick Garden Gifts comes gift boxed and with the wooden nest box already made up. Inside there are three pots of paint included (red, yellow and blue) and a paintbrush. You then just have to decide what design to paint on to encourage the birds to come into your garden. 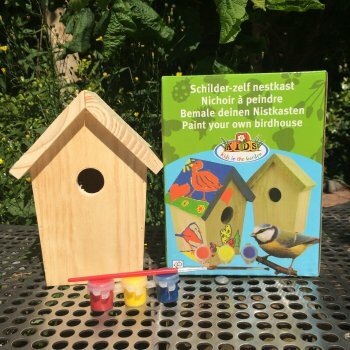 This nest box kit is a great way of getting children involved in the garden and in encouraging then to enjoy nature. A brilliant gift idea for young and old alike.